Jesus commanded: "Man SHALL live by EVERY Word of God." How can we prove that He included the Old Testament in that command? — that He meant ALL the Bible? DID YOU ever observe people going to Sunday School or Church on a Sunday morning? And did you ever notice what a large portion of them — if they carry any Scriptures with them at all — have merely a NEW Testament! A young man who had been a student in a Bible college for a couple years once came to me and confessed: "I'm all mixed up — frustrated! After all my Bible study, I suddenly woke up to realize that I'm not SURE that the Jesus of Nazareth, who lived 1900 years ago, really WAS the CHRIST! "I've heard you say over the air that we must PROVE all things — even what we have thought that we believed. Suddenly I woke up," he confessed," to realize that I never actually PROVED that Jesus was the promised Messiah! That realization FLOORS me. I'm totally FRUSTRATED. "Tell me," he said earnestly, "HOW can I Prove it? — HOW can I KNOW? How can I BE SURE?" That young man had never studied the OLD Testament of his Bible very much. I opened his Bible to certain OLD Testament Scriptures, and out of THEM he found POSITIVE, SATISFYING PROOF that Jesus was the Messiah — the SAVIOR of the world! I'm going to show you brethren, now, a part of what I opened up to him in His Bible. Many have gained the idea that Christians should never read the Old Testament at all! Many seem to believe THAT part of the Bible was DONE AWAY — that it was only for the Jewish people of long ago — that its message is DEAD today! Certainly our Church — the TRUE Church of God — is a NEW Testament Church! It certainly is under the NEW, not the Old Testament or COVENANT. But there's a great difference between the Old Covenant that set Israel up as a NATION and those SCRIPTURES we call by the name "Old Testament." The OLD COVENANT — meaning the AGREEMENT between God and Israel, made at Mt. Sinai — is replaced by the preaching of the NEW! But most certainly the NEW TESTAMENT SCRIPTURES show very plainly that those SCRIPTURES we call "The Old Testament" ARE NOT DONE AWAY, for we read in I Peter 1:25, "THE WORD OF THE LORD ENDURETH FOREVER!" Do you know, brethren, that for about six years after the crucifixion and resurrection of Jesus Christ and the founding of the NEW Testament Church, that this New Testament Church had and used ONLY THE OLD TESTAMENT SCRIPTURES? Christ preached the GOSPEL OF THE KINGDOM — the same Gospel He commanded every minister to preach under the NEW Testament dispensation, yet do you know He preached ALTOGETHER OUT OF THE OLD TESTAMENT SCRIPTURES? I wonder if you fully realize that the CHURCH was BUILT UPON THE WRITINGS OF THE OLD TESTAMENT PROPHETS, as well as on the APOSTLES? Notice Ephesians 2:19-20; "Now therefore ye... ARE BUILT UPON THE FOUNDATION OF THE APOSTLES AND PROPHETS, Jesus Christ Himself being the chief cornerstone." Notice Jesus' own example: While Jesus was sent from God as the Messenger of the NEW COVENANT — Yet HE PREACHED THAT MESSAGE OUT OF THE OLD TESTAMENT SCRIPTURES. He said, as recorded in John 5:39: "SEARCH THE SCRIPTURES; for IN THEM ye think ye have ETERNAL LIFE, and THEY are they which TESTIFY OF ME." Yes, they TESTIFY OF CHRIST. And do you know, brethren, YOU COULD NOT PROVE Jesus of Nazareth was the CHRIST, the MESSIAH, the Son of God — your SAVIOR and mine — WITHOUT THE OLD TESTAMENT SCRIPTURES? If we are definitely to establish and PROVE, beyond doubt, that Jesus is the Messiah — the Savior, we must prove it by bringing Him through the door of the Old Testament Scriptures — the prophecies PROVING Him to be the divine Son of the living God! For, as He said, THEY TESTIFY OF HIM! Moses wrote the first five Books of the Old Testament — the part which has often been referred to as "the Law." And Jesus said, "IF ye believe not his writings, HOW SHALL YE BELIEVE MY WORDS?" So the Old Testament Scriptures added another detail the MESSIAH who was to be the future RULER OF ISRAEL not only was to be born of a virgin — He was to be born and first appear in the little city of BETHLEHEM of Judaea. HERE we see it foretold that the Messiah was to be BORN, and to GROW UP from a child that He was to be despised and rejected, NOT hailed as a mighty King and Deliverer! If the Jews of 1900 years ago had only known and understood the Scriptures — and had their HEARTS been honest and their MINDS open — they would have recognized and accepted their Messiah and the Savior! But they were then following the religious traditions of THEIR time, just as nearly ALL the other churches are doing today. The Jews did NOT understand their Scriptures, just as Christendom does NOT understand the Bible today! This wonderful 53rd chapter of Isaiah tells us the Messiah was to come in human flesh, to grow up, to bear our afflictions and OUR SICKNESSES. Yes, HE was to be WOUNDED and to suffer for our physical, as well as spiritual transgressions, so that by His stripes — His BODY broken for us — WE are to be HEALED when sick! MANY OF US do not fully grasp THAT truth, even today! And did you know, brethren, that EVERY ONE of the original evangelists who preached Christ and the GOSPEL of CHRIST — which is the GOSPEL Christ preached, the NEW Testament GOSPEL OF THE KINGDOM — EVERY ONE of them whose preaching is recorded in the NEW TESTAMENT, preached CHRIST and the GOSPEL out of the OLD TESTAMENT SCRIPTURES? Through the remainder of his sermon on that day of Pentecost, Peter continued to preach Christ from the Old Testament — and 3000 precious souls were CONVERTED through Old Testament preaching that day! And yet, some people today still say, "You can't do that — you can't preach CHRIST out of the Old Testament." But the Spirit-led PHILIP did it — Jesus Himself did it — PETER did it — yes, ALL the first century evangelists of the true, original PURE Church of God did it! And we in God's true Church do it TODAY! 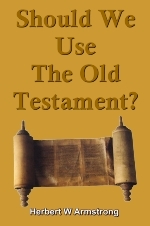 A very large portion of the New Testament is simply the Old Testament QUOTED. The New is BASED on the Old. The New Testament GOSPEL is based on the PROMISES God made to Abraham — for if we are Christ's, then we ARE Abraham's children and HEIRS according to the PROMISES (Gal. 3:29). Without the Book of Genesis, how could you establish the PROMISES you hope to inherit THROUGH CHRIST?